AEG has been a very busy company lately. They just celebrated their 10,000th card for LOT5R, they’ve been working on the success of Nightfall, their deck builder about werewolves and vampires, bringing it to the iOS systems, and of course, they recently released Smash Up! at Gen Con. They have a wide portfolio of games, including Tomb, Infinite city, and of course, some small deck-builder you may have heard of called Thunderstone. We recently reviewed Smash Up while at Gen Con, with our good friend Rodney Smith from Watch it Played, and today, I’m happy to bring you a very light game, based on the Tempest world AEG has created, called Love Letter. Love Letter is a very light game, how light? Well it’s only 16 cards! That’s how light! It’s playable by 2-4 players and is extremely quick, in about 15-20 minutes. We have a print and play copy to share with you today, so it’s by no means the final product, but let me give you some background. Love Letter is one of four titles built around the city state of Tempest. The others are Courtier, Dominare, and Mercante. Each has their own flavor they bring to the genre, but in essence, Tempest is a city state filled with intrigue, trade markets, political influence, and deception… and in the case of our game today, love. Love Letter is a very simple game to learn. It is made up of 16 total cards, and will come with markers to score the game as it progresses. Essentially, the story goes that the queen has been arrested for treason, and distraught and heartbroken, the princess has locked herself away in the castle tower. You play the part of a suitor in the city state of Tempest, who wishes to court the princess and ease her woes. Snce she is locked away however, you must do so through notes that are carried by intermediaries, and such is how you being Love Letter. The cards in Love Letter each represent a different intermediary or “helper” if you will. The game begins by shuffling all of the cards, removing the top card of the deck from the game, and then dealing 1 card to each player. This card is the person who is currently carrying your Love Letter to the princess. Each turn, each player must draw one card from the top of the deck, and play one card in front of them. The goal is to be the person with the highest value intermediary in their hand at the end of the round, which will result in that person delivering your love letter, and gaining a point. 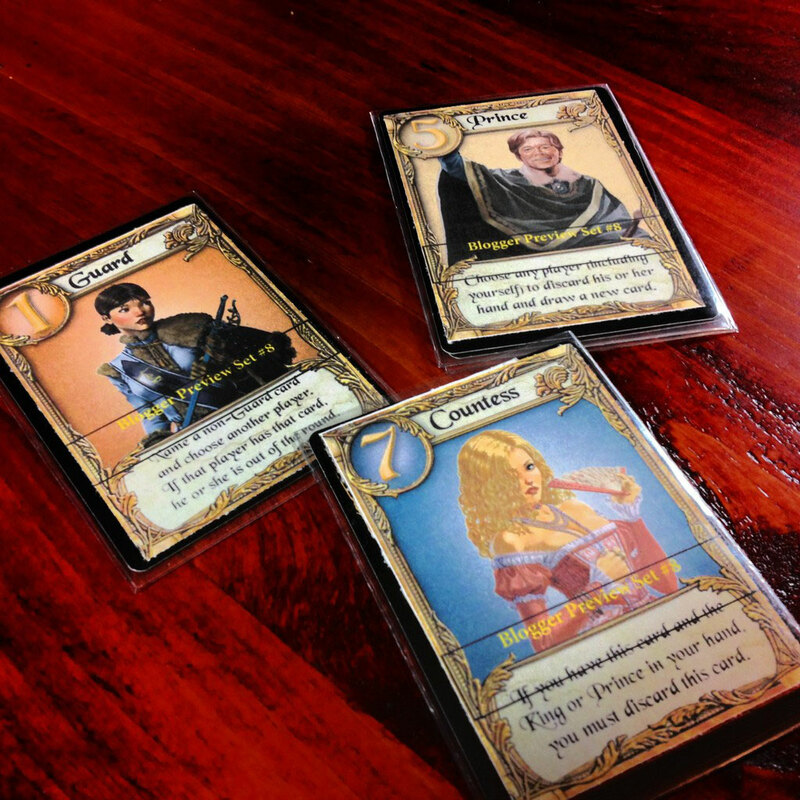 Depending on the number of players, when you reach a certain point level, the princess has ready enough of your Love Letters to let you court her, and you win the game. 5 x Guards: With the lowest value in the game of 1, these guards are suspicious of everyone in the castle, and if they seek correctly, they will eliminate opponents from the round. 2 x Priests: With a value of 2, these men are pious, so while they see what is happening around them, they tend not to get mixed up in the affairs of others… but can provide information for a well-timed guard or others. 2 x Barons: With a value of 3, who are fickle, and when played, will eliminate the person with the lower hand value from the round. 2 x Handmaids: Valued at 4, they are of course, looking out for the princess’ best interests, and will thus protect your Love Letter for a turn, to ensure its safety. 2 x Princes: As with all good royal settings, there are 2 princes as well, with a value of 5, and they are of course always looking for new ways to achieve victory, so they will allow you, or force another, to discard their hand and draw a new card. 1 x King: The King has a value of 6 and is very mercantile and trades hands with an opponent. If provided enough information from his priests, the king can be easily ensure the suitor of his choice benefits. 1 x Countess: Valued at 7, almost the highest in the game, she has the ear of the princess, but if spotted by the king or one of the princes, will be shuffled off, far away from the princess. 1 x Princess: Finally, there is the 8 value princess herself. She is beautiful and yearning for a suitor to heal her broken heart, but if anyone diverts her attention, she will remove you from the round! As you can see there is a lot of flavor with Love Letter! The artwork, even for a print and play, fits the theme very well. It’s light enough but detailed enough to give you the royal feel. The gameplay in Love Letter is extremely fast. EXTREMELY fast! This is not a deeply strategic game at all, but for what it is, it does it quite well. We have had the most fun in adding a story arc to the cards as we play them, meaning when we discard a guard, we act all suspicious and tell a story as to why we are choosing the name of the card we are. That adds a lot of fun to the game, but is of course, completely optional. The cards balance themselves well, and while not a high value, the priests and guards are deadly combinations to boot opponents out of the round if played at the right times. As mentioned, this is for 2-4 players and can play an entire game in less than 20 minutes, so as a filler game, this is one that hits the mark. In fact, that’s exactly the rating we’re going to give Love Letter, a Hit! 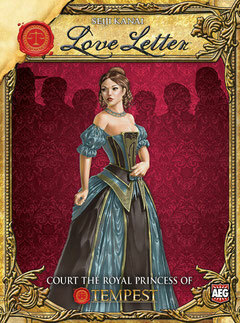 Love Letter provides a well-designed, light game that can be enjoyed by almost anyone. It also builds into the theme of Tempest quite nicely and at least for this reviewer, has piqued his interest for the other games in the set. It’ll give you a bit of a "trick taking" feeling with deception and bluffing added in, around a well-built world to provide you an enjoyable experience no matter where or when you decide to play! Not to be a jerk, but I noticed AEG had tried to keep the actual divisions of love letter's small number of cards under wraps - Posting it here might cost them a few sales to the unscrupulous, no? Great review though. First, I always ask if there is anything I "shouldn't" say or talk about in my reviews with the developers in cases like this, where a game is not yet out and they have provided a copy (or in this case, a Print and Play copy. I treat all relationships professionally. I'm not sure why you'd say that about them "hiding" the number of cards, as their web site has had the rulebook with the contents of the game, showing there is only 16 cards in the game for quite some while now. If you are saying that my review provides the quantity of the types of cards (like there are 5 guard cards) I'm not sure I follow you how that is costing them sales? And, even if someone knows how many components are in a game, how is it unscrupulous if they choose not to buy it because of those facts? Perhaps I'm just miss-interpreting your point, and happy to discuss it more, but I hope all my fans and followers known that I treat all relationships, inside and outside the industry, professionally. That all said, I'm glad you liked the review and took time to comment. Thank you! I don't think it's worth the time to discuss at length, but I was referring to the latter of the points you mentioned; To my eyes, the small number of cards makes it a far more attractive prospect to print out a dummy copy of than many games, and providing what is essentially the entirety of the game's content in a review facilitates that. If the developers don't see it as an issue, who am I to disagree. So I see your point, it is valid that someone who knows the total amount of the types of cards could do that. They would be missing the exceptional artwork and quality of component's AEG provides though in my opinion. AEG has not provided any feedback that they are concerned with that though. I think their reputation of quality components, artwork, and delivery speaks for itself. That all said, and I failed to mention this in my first reply, I don't think you were being a jerk with your comment. I welcome all kinds of discussion on the boards and our social channels and appreciate everyone who takes time to comment, start a discussion, or bring up points, counter-points, or things to correct, so I will never look at anything anyone says as "flaming". Unless of course someone is insulting in how they bring it up, this definitely wasn’t the case here. Love Letter is a very fun game, and one that I think will be well received when released. The point is valid. In fact, I found this page searching for the number of each cards so that I could print my own copy. Now, if I enjoy this game (and I think I will) I will definetely buy the real stuff as soon as the shops here in Sweden get it. This is exactly what I did with the wonderful little game Hanabi, that's been out of print for a few years. At Essen this year a new print was available, so I replaced my homemade version with a real one. And frankly, I don't think this hurts the business. On the contrary I think they will sell more copies if more people find out about the game. A real print for the right price will always be more attractive than a homefixed version. Well said Anders, and welcome! I agree, I think the factory print will always be more attractive in the end. Thanks for watching, reading, and commenting! Your review sold it pretty good. Regarding loss of sale the not-completely-unknown SF author Neil Gaiman actually realised he sold more books if he made them available for free download. He talked about it and asked how you found out about your favourite author? Probably by borrowing some books from a friend or a library. Not many people hits the jackpot and buy something they don't know, and it's the same thing with games. There's a site called boardgamearena I signed up for a year ago or so, and it introduced me to several games I found to be so good I wanted them (Race for the Galaxy, Kahuna, Dragonheart, it woke up my slumbered interest for Dominion), so that site alone is responsible for increased sales. So when I replace my homemade versions with retail ones I will give away the redundant copy, and hopefully another person will learn to love that game. Anyway, great reviews, my hat is off! That's awesome, I'm glad they have copies there! Surprisingly, we're still enjoying it. It's a great filler game in my opinion. It works out great when maybe you're playing a game where people are knocked out and have to wait for the group to finish. Hope you enjoy it! I just got a set of these Heart Tokens! Much nicer than the little red cubes that come with the game and add a nice sounding jingle when you shake the bag. Or an online bot with human players?